Here is a newly designed V24 Combo Centrifuge from LW Scientific. Engineered and assembled with proud in the USA. The new LW Scientific Combo V24 centrifuge has a durable metal construction. Two main configurations available as no built-in tachometer and with built-in digital tachometer. 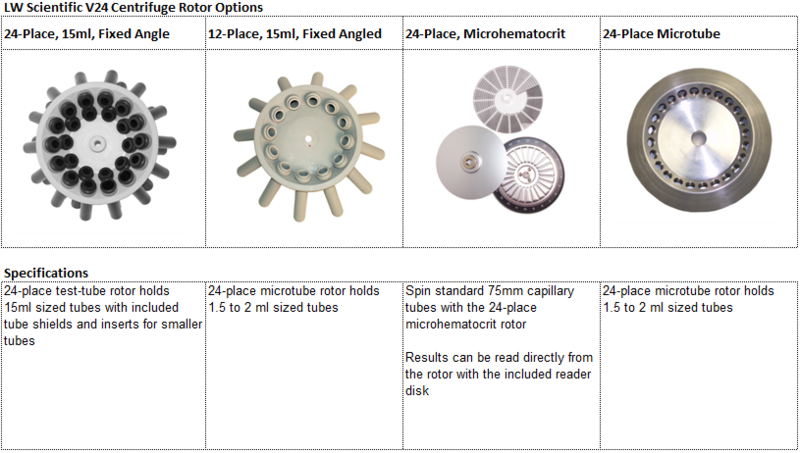 The LW Scientific V24 Combo centrifuge gives you the convenience of spinning various different types of tubes with the available selection of interchangeable rotors without requiring any tools. The V24 combo has a strong 4000-12,000rpm variable speed motor which generates up to 14,500 G-Force (based on the rotor being used) It has a 30 minute mechanical timer. Electric brake allows fast stops.